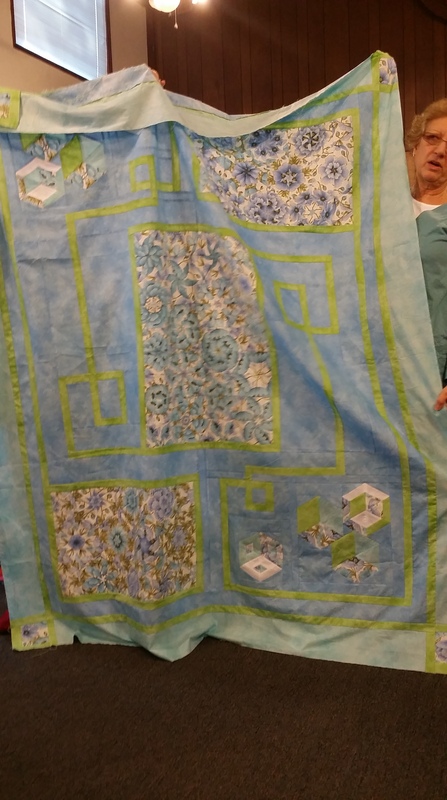 Ocean Waves Quilt Guild, Lewes Delaware held a show with the theme of Paying it Forward, highlighting all of the Community Service groups that our guild supports. 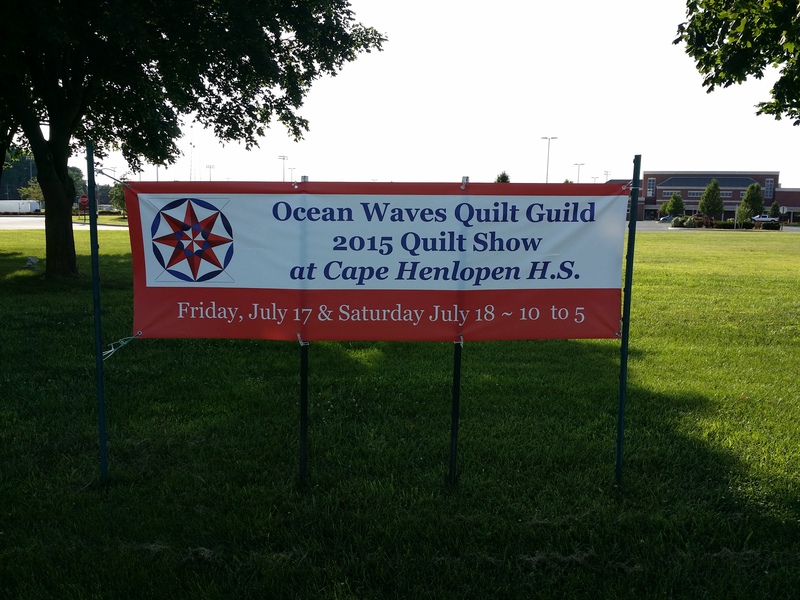 We had a great show in Lewes DE on July 17 & 18. Our members quilts speak for themselves. These are just a few of the photos. 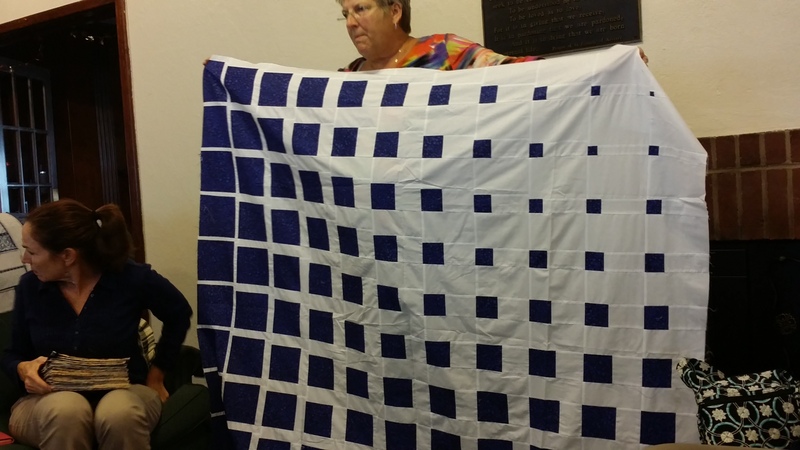 Over 250 quilts were on display. I took photos of a ‘few’ of my favorites. Note; as you look at the photo’s, the Information Card precedes the quilt. As you browsed through, how many famous quilt designers patterns did you see? 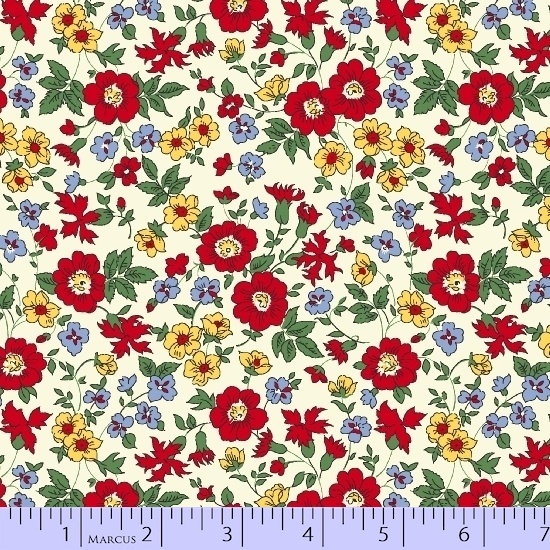 There are at least 3 Bonnie Hunter patterns, a Heather Kojan pattern, and many many more! If you read the display cards, you will find out the specifics of the pattern name and designer, along with the quilter. Hope you enjoy, and the next time we have a show, I hope you can come! All in one covered box! Stuck in hard styro to dry. works with metal & plastic. Has a LARGE opening tho! UPDATE ( 1 Dec 2015) – UPDATE – It seams that someone else has written a great tutorial for this project -Nancy West has nice graphics and instructions on her blog – My Fancy Nancy Life . I’m not sure if I saw this when I was looking for a method, but her project is similar to mine. Differences is she likes fancy pins, my pins are “very utilitarian” . The pins she used are way more expensive than the yellow headed quilt pins I used. (I was making lots!!!). Of note; I bought my glue, the pins, the beads, numbers and letters, all at Hobby Lobby. I was asked on a Facebook One Block Wonder forum “WHY make pins?”. I thought the best way to answer was with a photo of how I marked my first (and only completed) One Block Wonder. 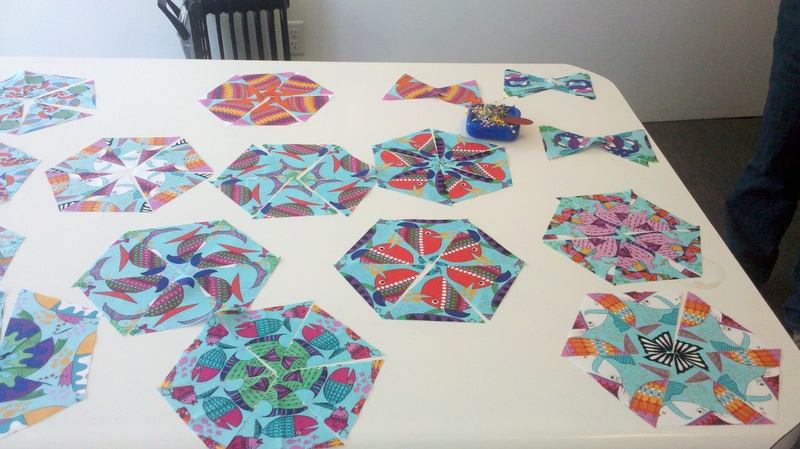 I was also asked if I plan to use them for other quilts. The answer is YES…any time you need to mark your columns/rows these pins will be effective. There is a lot of “design” that goes into a OBW once your triangles are all cut out, and sewn into 1/2 hexigons. You don’t want to “mix up your carefully planned arrangement”. Numbering helped to keep it straight! 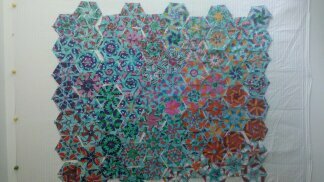 This picture shows the hexi’s once the triangles have been cut and finding a pleasing arrangement of the 6 triangles. The ones that look like “bows” in the upper right corner have been selected and the center point pinned (3 pieces on each stack). That pin helps to remind which point of that triangle is going to be in the center. 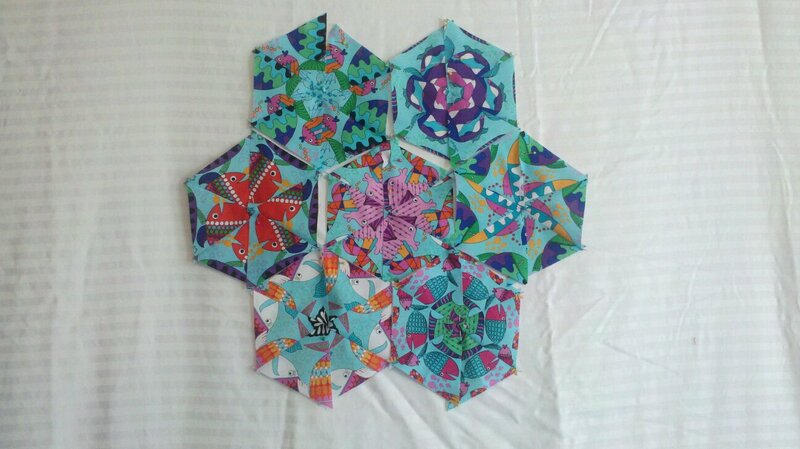 A little sewing (1/2 hexi only); then it was time to start arranging on the design wall. Once a final layout has been chosen; it is time to “make the quilt”. We quilters like columns and rows. Each half – hexi had a column/row marker. I did this with paper and straight pins. My “teacher” (also known as the One Block WonderWoman) had me mark in the same method that she used. The goal here is not to “confuse yourself” as you take them from the design wall to the sewing machine. Would you like to know what the original fabric looked like and the final quilt looked like? Take a look back to 2012 ! This quilt was for my third grandchild; made before she was born. We fondly referred to her as Baby Bulldozer (named thus by her older siblings). 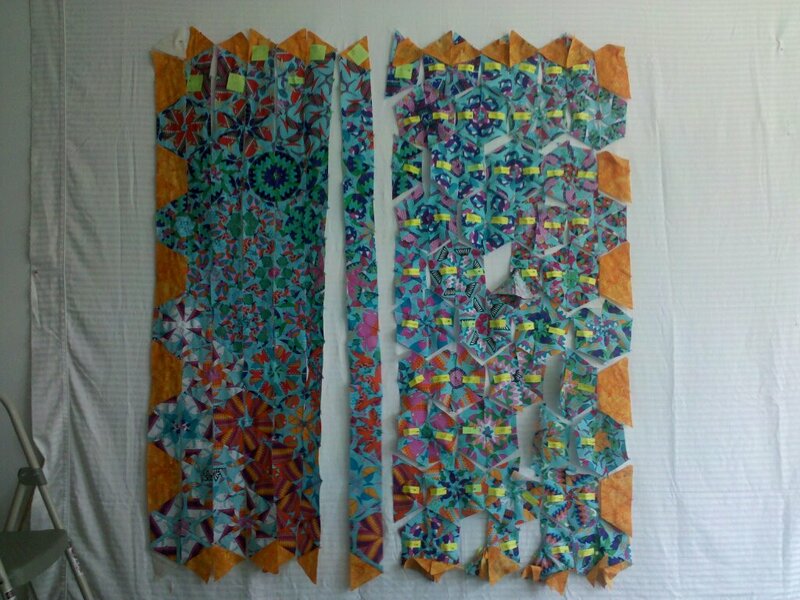 She will also get the 2nd Grand Illusion Mystery quilt; and I had fun “tying them together” using the fish fabric again. I was 2 of her books, the one mentioned here, and also the ENCORE book. They are still available and you can pick one up at your local quilt shop/show/book store or Amazon. My OBW marking are finished, stored in their handly little container and waiting for me to start another OBW. I actually have one started (and put away in my UFO stack from last year) and the fabric for another bright and cheery one. 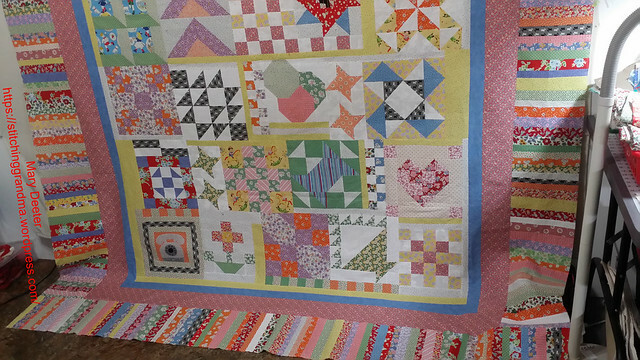 But first, I have a Quilts of Valor to make; on a deadline…..more about that in a future post. Have a great day, and ENJOY the first day of Spring! 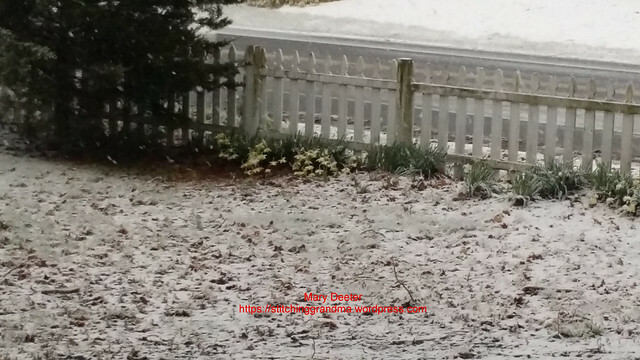 We had snow showers this morning, but now it is raining; and I can live with that! Time to sew! Well, it seems to be working, my little One Block Wonder pin project. 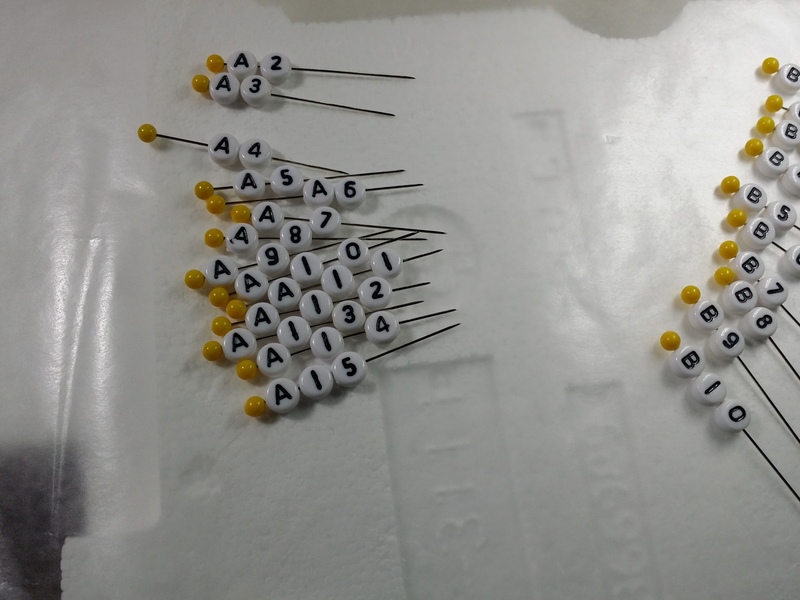 E6000 glue; quilt pins (1 3/4″) and small alpha/number beads. Next to solve the storage question. And to build J1-15 to Z1-15! So, here is how to do this: Sort your letters and numbers and lay a bunch out; ready for glue. Apply a dab of glue to the pin shank above the letter bead and below the letter bead. 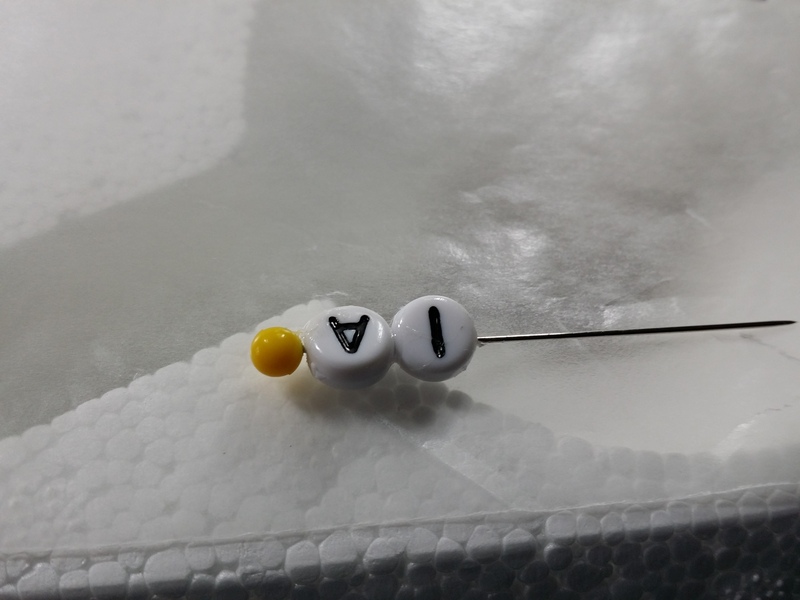 Then slide the number bead up the pin until it touches the letter. Hold for a brief moment the shove it into wax paper covered stryroam block all the way until it makes contact with the bead. This prevents the bead from slipping down, and any glue that might be excessive will be on the wax paper. They pull easily out of the styrofoam after they are dry. Well, it seems to be working, my little project. UPDATE – It seems that someone else has written a great tutorial for this project -Nancy West has nice graphics and instructions on her blog – My Fancy Nancy Life . I’m not sure if I saw this when I was looking for a method, but her project is similar to mine. Differences is she likes fancy pins, my pins are “very utilitarian” . The pins she used are way more expensive than the yellow headed quilt pins I used. (I was making lots!!!). Of note; I bought my glue, the pins, the beads, numbers and letters, all at Hobby Lobby. 2nd Mystery quilt top done! 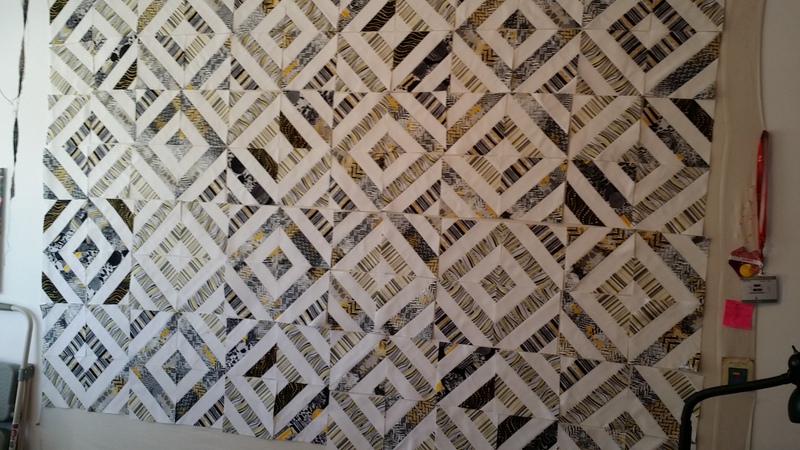 I have finished the 2nd twin sized “Grand Illusion Mystery Quilt”; designed by Bonnie Hunter – Quiltville.com with minor modifications to the final layout. 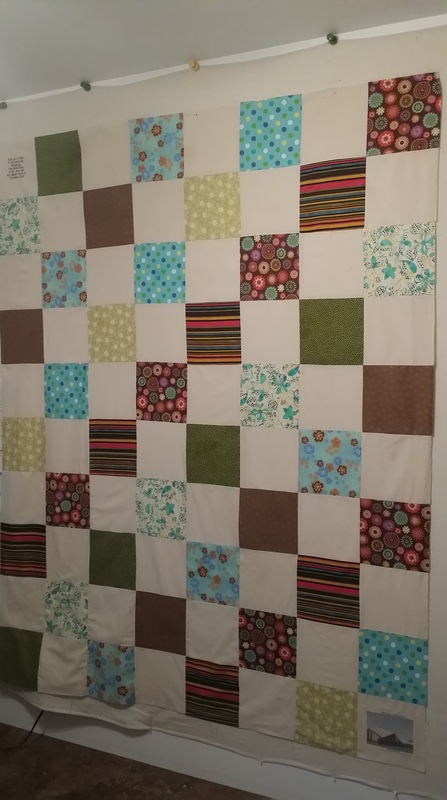 I used 12 of the big blocks; more of the green & white & black checkerboard sashing; and added my own layers of sashing in yellow and bright green and turquoise to the blocks. 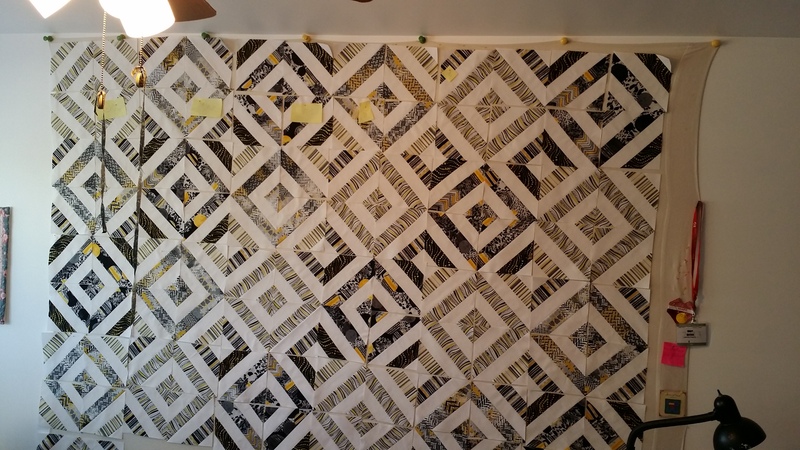 The final border is a pieced border, made with 2.5″ squares, a bit different than what Bonnie designed in the original pattern. My goal when I did the checkerboard and final border was to use up some of the parts I had made during the “clues” process. 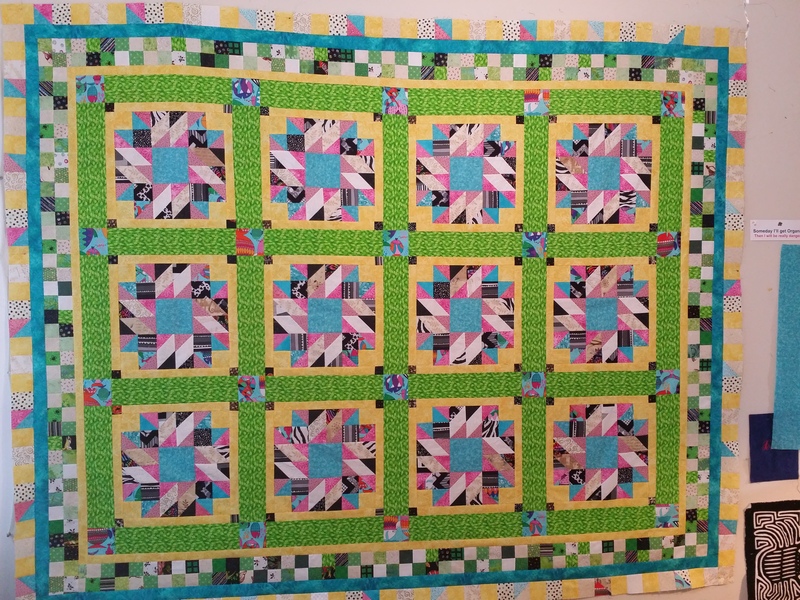 I actually ran out of those turquoise and pink half-square triangle pieces and had to make about 6 more. Somewhere in the “clues” process I mis-read instructions and sewed together neutrals and yellows (2.5″ squares). They ended up as the final border. I plan to bind the quilt with yellow binding with a turquoise flange. Hoping to get it layered up for quilting in the next week or two. 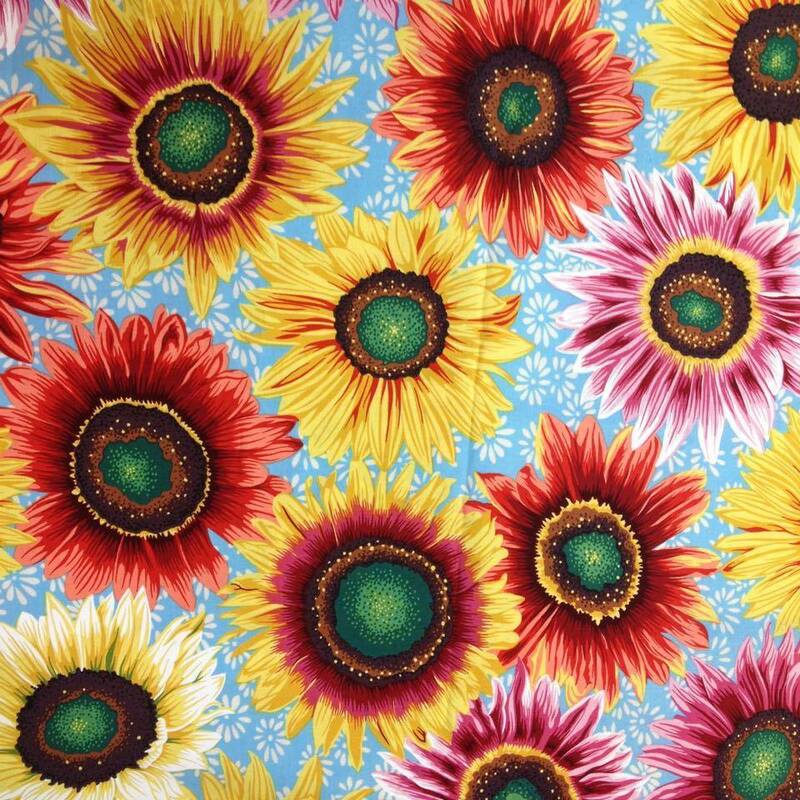 Here is a peek at the fabric I chose for the backing. I had originally bought 3 yards, and made a trip to Hobby Lobby for more yesterday! 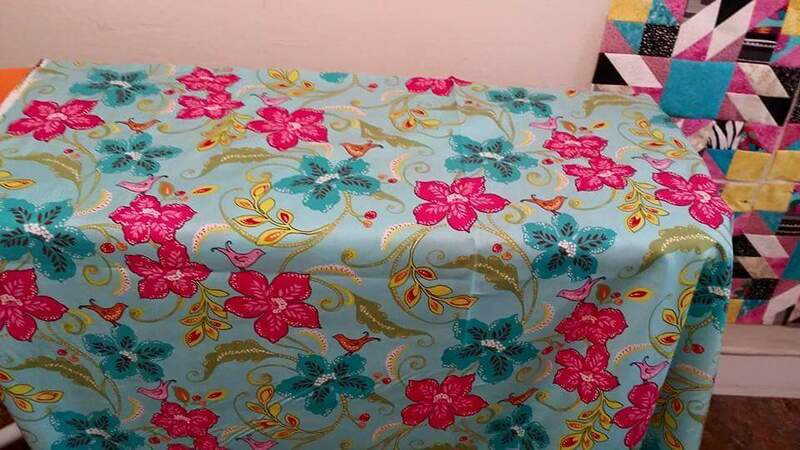 This fabric is directional and has the sweetest little bird on it! I always buy extra when doing backings and hope I got enough extra to get a good match up to the pattern. 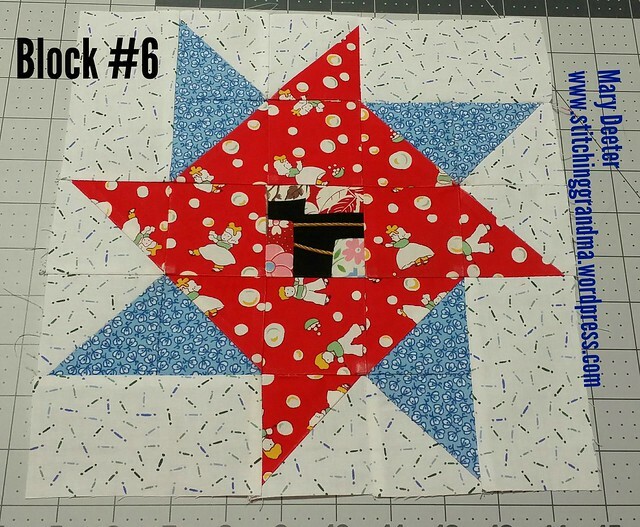 I have one other “scrap project” underway; playing with the double diamonds and half-square triangles, but I am not sure I am loving it’s current look….so I will engage my new seam ripper before I show any pictures. In other activities; I have been 2 two quilt shows in the last 3 weeks; one in Hampton Virginia; by bus with the ladies & 1 gentleman from the guild. Last week 2 friends accompanied me to the AQS show in Lancaster PA. I have gotten my gadget, thread and fabric fix for a while! I bought a cute pattern and a pile of fat quarters in Hampton to do a “cat” quilt. My friend Barbara got a companion pattern and she & I are planning a day of applique cutting and fabric sharing. At Lancaster I stockpiled 1/2 yard bundles of red, cream and blue for a Quilts of Valor project. I am going to use a Bonnie Hunter pattern for that project. 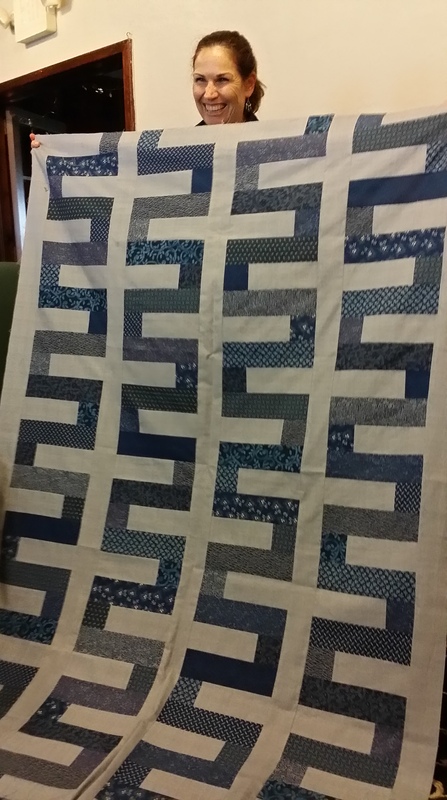 I have a deadline for it; early July for our guild’s quilt show and subsequent donation. I need to get busy with it! I will post some photo’s as I work through the project. Along the way, last week, my quilting sister in law – Carolyn also known to some as the One Block WonderWoman ( http://www.Oneblockwonderwoman.wordpress.com) twisted my arm and convinced me to join in on a One Block Wonder challenge that is happening with a Facebook group. She was shopping for the fabric, and gifted me 6 yards of this wonderful fabric. Can I tell you how tempted I was to use this on the back of the GIMQ#2 quilt instead of buying more of the fabric with the little bird? I am hanging on to this for the challenge, and right after I get my QOV going, then I will think about this one! In the meantime, part of my clean-up involved gathering all my flower head pins that are numbered. I need them for the OBW. Well; the markings have worn off so while I was at Hobby Lobby, I invested in a new box of pins, some beads and some great glue. 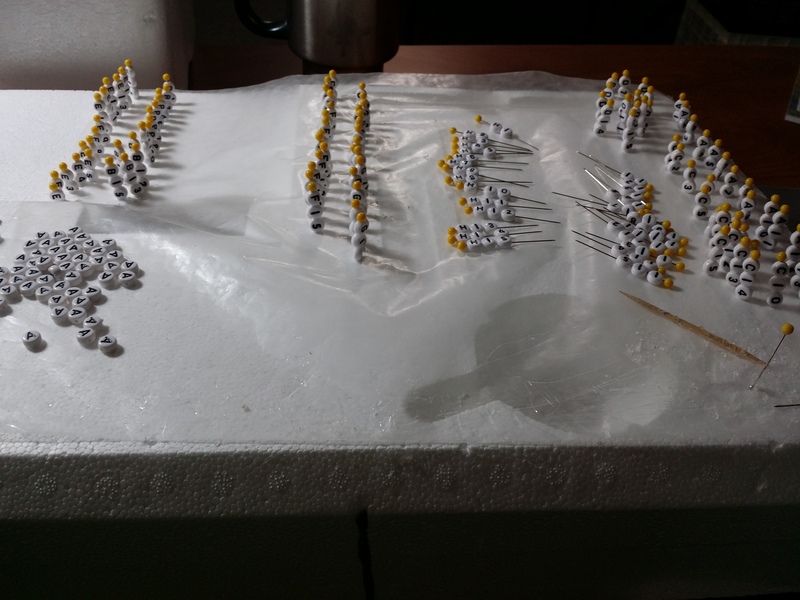 And, I am working on this little project – I found 1 3/4″ quilt pins and tiny beads with letters and numbers, and some glue that seems to be holding, so I got busy building sets A1-A15; all the way it I 1-15. For what ever reason the I’s look like 1’s, so that set is kind of funny; and there is an abundance of U’s in the letter package and a shortage of D’s and Q’s. But, I think I can make it all work. 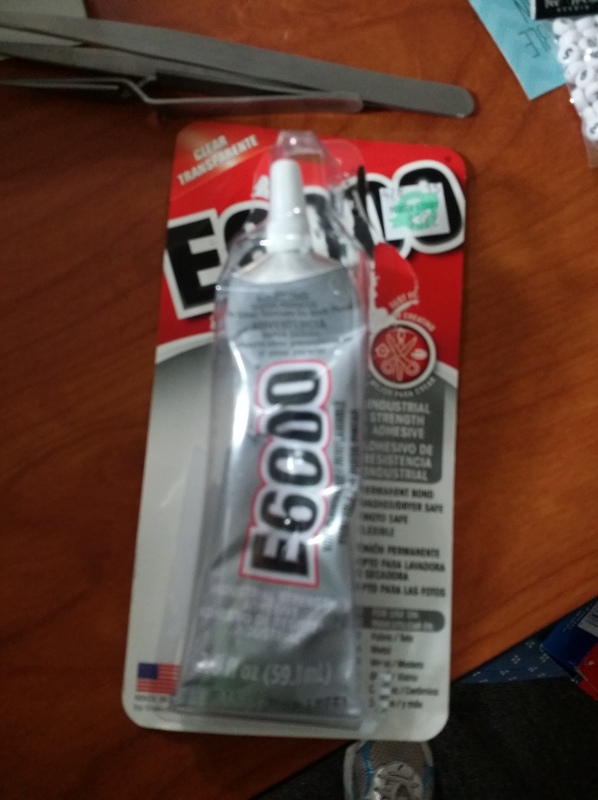 The glue has too large of an opening, and I should have gone for one with a fine tip; but I took the clerks recommendation and am dealing with it using toothpicks to apply. The idea of these pins is to label every One Block Wonder Hexi Block once the design is created. Check out Carolyn’s page and here great descriptions of her quilts. I have only completed one OBW, under her supervision, so I am going to keep my fingers crossed. ( I do have one in the UFO stack…sssh) I did trip over a blog yesterday with great video’s to remind me of the process ( http://ifthesethreadscouldtalk.com/new-york-kaleidocally-hexed/ ) and I have both of the Maxine Rosenthal One Block Wonder books to use a a reminder. You would think I could talk Carolyn into a visit……..we could have SEW MUCH FUN !! 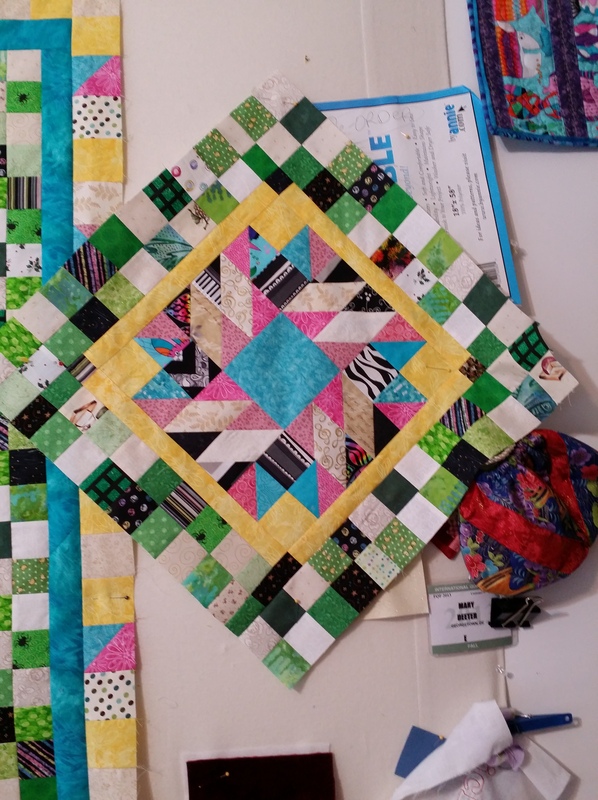 SEW…the projects are multiplying, the chaos is still managable, and I need to get GIMQ#1 under the needle and QUILTED. What ever you do, I hope you are having fun! I certainly am! Well; you know I have been off the mark working on my blog for a few months. 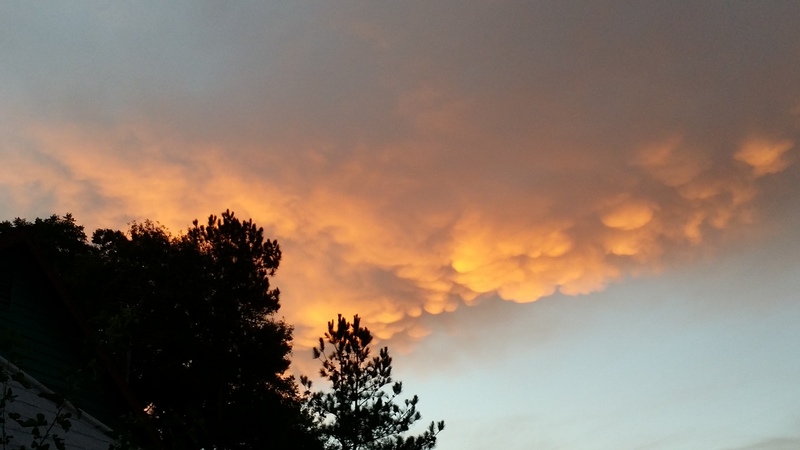 If you read my blog on a regular basis you know life has been a little busy. My daughter and her family were here at the beginning of the month. I started a new quilt project in October, that I will show you a glimpse of. The month flew by! 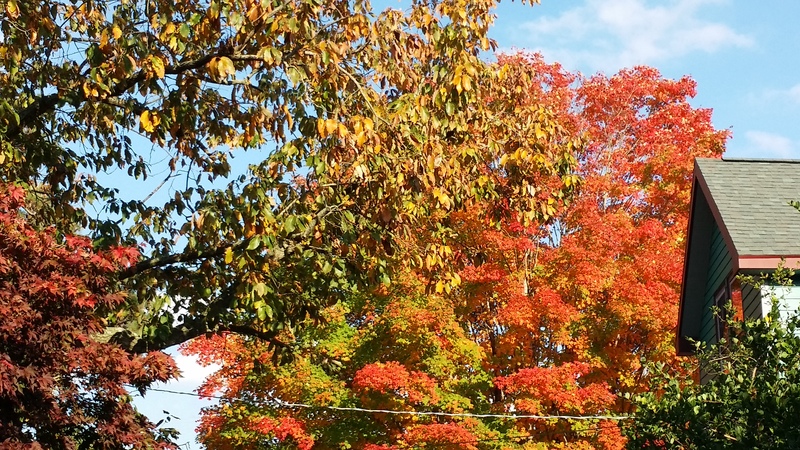 The title of this post is a PEAK AT OCTOBER – this is what it was looking like last week at my house. I had a wonderful time in October, with my quilt bee friends. We meet once a month at a members home, and have a lot of fun, sharing projects, enjoying lovely food, and working on something worthy. In September and October we worked on “heart pillows” for breast cancer patients. Stuffing the pillows and stitching them closed kept our hands busy while we visited in October. When I arrive at my friend Gayle’s house, I was a bit late, and was told to”wait at the door and close my eyes”. I heard a lot of giggling and silliness and when given permission to turn around – this is what I saw! 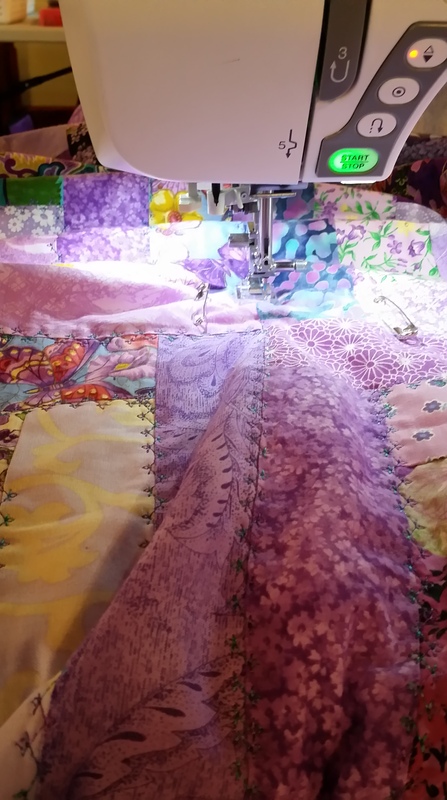 The Material Girls Quilt Bee does know how to have fun! 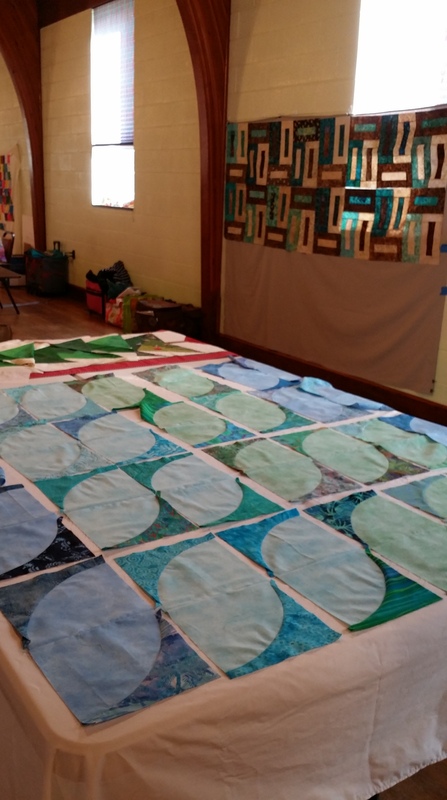 We participated at the end of the month in a “multi-bee” sit & sew for 3 days. 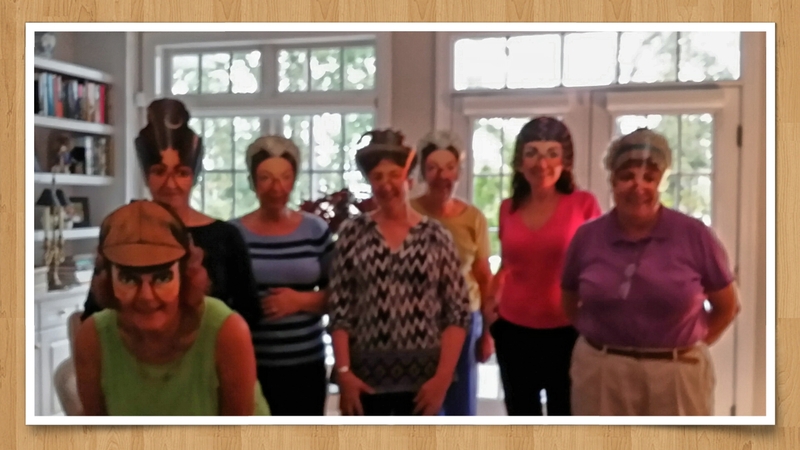 Three “bees” from Ocean Waves Quilt Guild get together for fun! Everyone brought their own projects and worked on them, and we had wonderful conversations and meals. It is always interesting to me to see what people are working on, and what the manage to get accomplished in 3 days of sewing. I’m sure I could get more done, on my own at home, but it would not be as much fun! The lovely thing about these gatherings is the opportunity to ask a question to a more experienced quilter, and learn from their experience. Everyone seems to wander around the room visiting, catching up, and ooohing and aaahing at the variety of projects underway. There were people doing foundation piecing of Christmas trees, and Storm at Sea; there was a lady working on a block that required about 7 or 8 different templates. 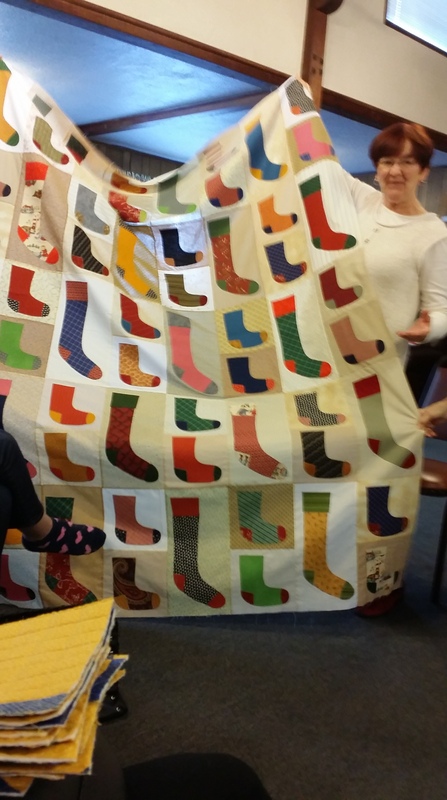 There were projects being completed from our guild retreat in February, and there were several new projects just getting started. Enjoy the photo’s. Cindy Jones using beautiful musical fabrics. The project I have “under the needle” is what I worked on. I did some quilting extra blocks to make them into throw pillows for a day and 1/2; then started quilting a log cabin twin sized quilt. I love using the pretty stitches built-in the machine. The pillows were a great practice time for me. The quilt under the needle is for my “great-great niece” who just turned a year old. I had intended to make her a baby quilt last fall but never got to that point on my list. So, she gets a twin sized quilt which will last her a bit longer in life any way. I made it in my sister Cathi’s favorite colors, because she is the great-great Grandma!!! Last post I chatted about a “SECRET” project…well…I still can’t share it, because it has not been delivered yet. More later in the month I hope. I did my part, and now my co-conspirator is working her end of the arrangement. Shhhh….don’t tell. I have to say, it is NO FUN keeping the secret, but the delivery will be awesome I am sure. 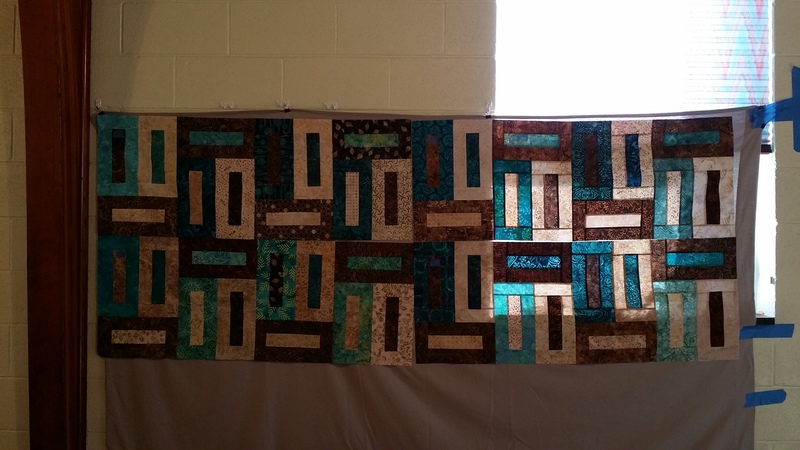 My special long arm quilting buddy thought up the project and is going to border, quilt and bind the project. 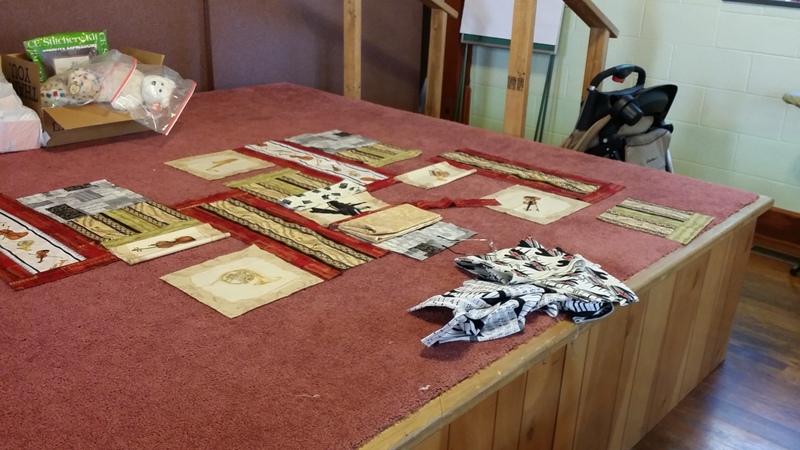 So, did you spy the Modern Quilt Studio patterns by Weeks Ringle and Bill Kerr in the photos? There were 2….and I have made one of them myself back in June. Enjoy this beautiful Sunday and happy stitching! The last blog I wrote was called “Sewing like Crazy” – and then not a word of my own for an entire week. That is because this week has been “full of stitching”. In between being the DRIVER for a visit to the local surgery center for the hubby and his cataract surgery Tuesday, and follow up Wednesday, Bible Study Monday; Church council meeting Tuesday, and Quilt Bee on Wednesday, I got to sew. I had one eye zapped with the laser on Tuesday (that was an interesting activity…wide awake) to break up the scar tissue from my own cataract surgery several years ago. Now that I look back I wonder how I found time…but I did. This is the first year in the last 5 that I am not coordinating the project, just sewing. This was one of my 17 items on the to-do list; and I have officially crossed it off!! I could not wait to get this “off the wall” so I could move on to my “Summer in the Park” quilt. I could have finished the Senior Quilt earlier in the week, but I was distracted obsessed by making all the blocks for “Summer in the Park“. I also have a memorial t-shirt quilt laid out on my work table. (More about that in another post). 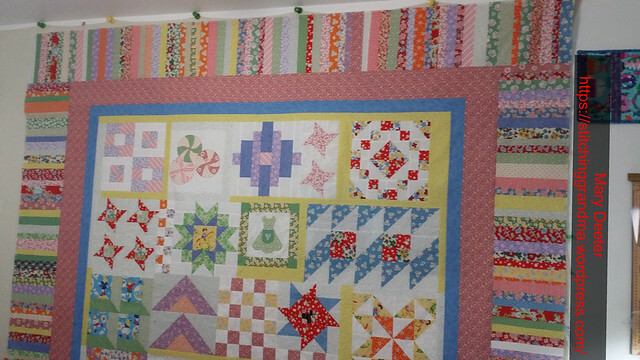 I took my One Block Wonder blocks off the wall to put the Senior Quilt up. The OBW blocks are put away for now…but that makes 4 active projects!! I had the sewing desk and the cutting table and the iron table, the ironing board all covered in squares for “SIP“. I had to make myself a bit of a graph on the computer to figure out how many blocks I needed. I started the week with 64, and ended up making 144. Not sure I will use them all, but I do have a layout. Once I decided to go BIG, I had to make another run for fabric on Monday! (of course) I needed more white fabric, and I thought I needed another yard of one of my ZEBRA stripes. Well, you know what happens sometimes when you run out of fabric..you just can’t get what you want. I was lucky in that the shop had TWO more black-white-yellow prints that I could add to my mix. In the end, I had 5 different types of blocks. And I have enough fabric left to do sashing, borders and the back. Ok, I over bought in the beginning….and I have leftover blocks. I hate to not have enough fabric. The first layout made my eyes hurt.…. 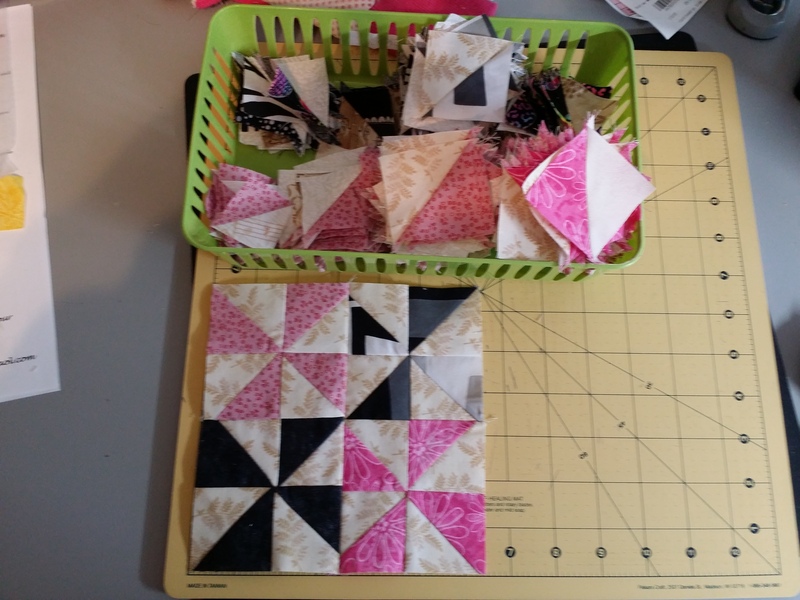 I was not laying my blocks out the way Shontelle Stayner had in her pattern. I was trying to make “mixed” blocks and alternating blocks. It felt chaotic. If you click on the photo above, you can see all the varieties of fabric that I had used for this project. So; everything came off the flannel wall, and back into neat little stacks on my ironing table. I pulled the pattern back up – printed it AGAIN (3rd time..where did I put it anyway). Took one look at the picture on the first page of the pattern and realized what I had done wrong. So; here is the FINAL layout…. Now that there is a pattern and a plan, the real sewing begins today. On Saturday, I made another strip set to “fill the whole” at the bottom; and got the “four patches” put together on the bottom row, and today I will work on it again. Need to stay focused on SIP, so I can get as much done as possible while I wait on 2 packages to come for the memorial quilt. Actually more than 2 packages. I received the June Tailor T-Shirt Transformation Ruler I ordered from Amazon. (Had to cancel my order with Nancy’s notions – on back order until the middle of MARCH!!!). I am waiting on the stabilizer and pressing cloth to come early this week. I had lots of discussion with my friend about fabrics for the t-shirt quilt. The shirts belonged to my friends father, and he was a NYC police officer, loved the St Louis cardinals, and other sports. I spotted theses when I was at my local quilt shop Monday – I took a chance at 25% off and bought 1 yard of each. This package should arrive sometime this week. We did lots of on-line shopping together and were unable to locate any St Louis cardinals fabric. I did find two lovely EMBROIDERY designs for St Louis cardinals…and will download and stitch them out. The only fabric you can get for St Louis cardinals is fleece, and that was not an option I would take for this quilt. I have a special fabric which will be a surprise for the back of the quilt. It is also coming by mail and has already been shipped. The decision to make this into a wall hanging has been made; so a pocket on the back will be included when I bind the quilt. It is fun to think ahead to this quilt while I work on SIP. I think I enjoy the design element of a project just as much as I like the sewing! !